 Five tips to help you find an amazing camping spot for your next ADV Ride. Finding a perfect camping spot can make an evening under the stars simply magical. After 30 years of motorcycle camping — ranging from dirt bikes to sport bikes to my current BMW R1200GS Adventure – I have uncovered a few tricks to finding a great camping spot. I abhor camping in KOA campgrounds with the RV’s humming like giant bees on crack cocaine and kids running through my campsite at 1 am. I prefer to find a scenic location with maybe a babbling brook to mask any sounds at night, or a majestic vista that I can gaze upon while sipping coffee from my Jetboil early in the morning. I personally don’t like planning my motorcycle trips in such detail that I know where I am going to camp each night. I usually don’t even know what route I am going to take. Instead I normally “wing it” and just start out with a destination in mind and a general direction I want to travel. Typically, about an hour or two before sunset I am looking for a place to pitch my tent that is scenic, quiet, and safe. Sometimes that might be a nearby state or federal park, other times it will be camping in the wild, or I may at times ask permission to camp behind a landowner’s barn. I prefer to let serendipity into my trips, which often brings me unexpected adventure, both good and bad. These are usually great places for motorcycle camping. I try to find parks that are not all that well known and hence busy. I can usually find hot showers, mowed grassy areas to pitch my tent, and a picnic table to unpack my bike and dry my gear if needed. Many are located near scenic views — lakes, rivers, overlooks. During peak camping season — 4th of July, Memorial Day, Labor Day – you may want to avoid the crowds, but on many weekends and most weekdays these make for great camping spots. These generally make great motorcycle camping locations, although the amenities and quality of camping can vary widely. Some of the best National Forest Campgrounds are in remote areas with little if any services, so you may end up dry camping. I’ve had good success finding remote campsites with a campfire ring and enough wood to build a decent fire. Just make sure you carry sufficient water. You can find National Forest Campgrounds at the U.S. National Forest Campground Guide. I seldom motorcycle camp at National Park campgrounds unless it is during the off-season. They are generally crowded with tourists and are primarily designed for RV camping. 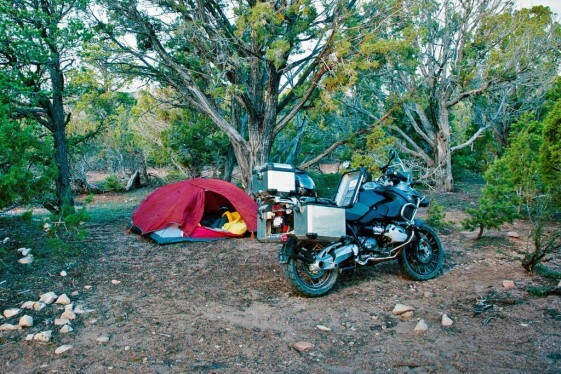 However, some National Parks do offer backcountry camping opportunities outside of the designated campgrounds that are excellent for motorcycle camping. You can find out more about the rules and regulations of camping in National Parks by visiting the U.S. National Park Service website. If you are not afraid to talk to people, some of the best camping can be had by just asking “may I camp on your property?” I seldom get refused and generally find some fantastic spots for motorcycle camping near creeks and rivers, behind old barns, or in remote fields near ponds and lakes. I generally try to strike up a conversation first and let the landowner know where I am from. I always try to complement their place and let them get to know me first before asking. An indirect approach usually works best. I might ask “Do you know anyplace nearby that I could pitch my tent for the evening?” Then I might mention “Down by your pond would be awesome.” Oftentimes, landowners will invite me to dinner and a few times have offered a warm bed, a hot shower or even cold beer. In the western United States it is fairly easy to just camp out in a remote wilderness location. Although, at times it can be difficult to tell if the land is private or public. If it’s not clear whether camping is permitted, I try to get “out of site, out of mind.” Camp away from the road, behind some rock cliffs, close to a creek bed, down a cow trail or behind a stand of trees. On occasion, I’ve been confronted by landowners in the middle of the night, but if you are nice and apologetic and respectful it’s usually not a problem. Wild camping offers some of the best opportunities to unwind in perfect solitude. Motorcycle camping can be great fun when you find a place to camp where you can relax and feel comfortable. I’m always on the lookout for great camping spots while riding and if I find a particularly nice location, but it isn’t time to camp, I will mark the spot on my GPS for possible use on a future trip. Sometimes you don’t have the option of an awesome camping spot though and have to make due with whatever you can find, such as off the side of a highway, a hidden field behind an industrial building or a gas station parking lot — all of which I have utilized. 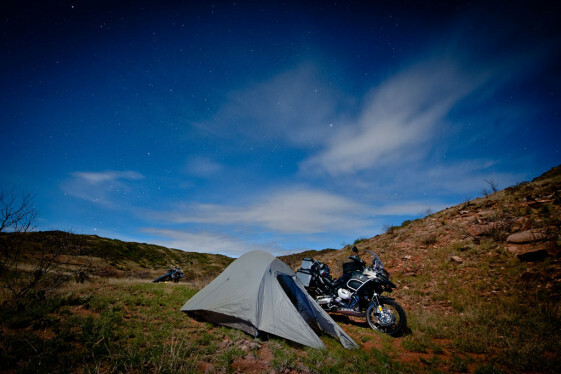 Quality camping gear helps with the comfort issues and using these motorcycle camping tips will help you find a camping spot that can turn a long day of riding into a magical night under the stars. James has been riding motorcycles since 1978 when he purchased a Yamaha XS-650. As early as 1980 he was touring the U.S. on sport bikes adapted for touring and started racing dirt bikes in 1984. He has toured all over the U.S. and his photos have been seen in nearly every major motorcycle publication. James regularly contributes to Roadrunner Magazine, Adventure Rider Magazine, and was a participant in Cycle World’s Adventure Challenge. He currently owns a BMW R1200GS Adventure, a DRZ-400s and several other motorcycles. James lives in Edmond, Oklahoma with his wife Kay, who also is a long time motorcyclist. I would add, if you must camp on land without permission, do not build a fire unless it is a health and safety issue. Land owners are usually less upset about a tent, but fires tend to really make them mad. Never thought about asking farmer or rancher to camp on their property. Good idea. All good spots. Remembering that what you find appealing animals also find appealing. So don’t forget to be safe when camping especially wild camping. So take the time to investigate your spot and maybe set up some animal deterrents for our larger less friendly guests that might stop by. Rocky Mountain Adventure Bike Touring Company Ltd.
Another good spot is behind old country churches. They’re generally never in use (except for Sundays), have ample space, hidden from the road if you’re careful, and no one will care if you’re camping and don’t make a mess. I’d probably avoid creek beds in the West, especially from late June through September. It doesn’t have to be raining where you are at for a flash flood to overtake you. National forest, state parks national park are always full and you have to make reservations out a year at most places. That doesn’t seem as sporadic as waiting g till 2 hrs before sun down. This honestly did not help me plan a trip at all. Not a single confirmed location.